Productive Training, Clinics on the Thai-Burma border: March 6-17, 2013, a small Alaska team of Kayla Rowe and Elle and Bob Arnold traversed the Pacific to greet Eubanks out from 4-month Burma mission, Introduce Medic Nay Hser to our friends in Bung Klung, and dedicate the AlasKaren Training Center. Friday horses with Eubank kids and FBR office meeting. Saturday smooth drive all the way to Bung Klung including prayerful meeting with Karen medic NayHser and his friend Goong Goong; Nay Hser has excellent training in small-incision cataract surgery in MaeLat refugee camp. Eliya has worked hard to nearly complete the training center / clinic and we dedicated it as the "AlasKaren Training Center." Unfortunately the wall-mounted, Zeiss OPMI-1 scope light burned its transformer- we attempted one case with flash-light substitute, but have deferred the microscope surgery until June. Elle and Kayla directed sunday school watercolor ministry for Day-of-Prayer Sunday. Nay Hser translated as Bob shared in church. 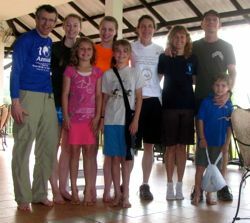 We travel to LayTongKoh tomorrow for overnight, clinic, medic training and worship. Need new microsope, more Burma bifocals and custom lenses for next time. Dr. Bob and Nay Hser held several training sessions for medics from both sides of the border in LehTongKoh and in the new AlasKaren Training Center. 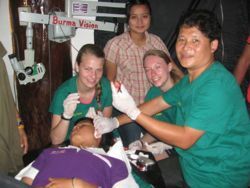 Kayla and Elle assist in ear surgery. Many cataract, pterygia, glaucoma surgical cases scheduled from the June trip. Smooth drive 1440 KM total back with waterfall cliff-dive, and great meeting with Dr. Frank Green in Maesot. Quick, but sweet morning at Ranger Ranch. Thanks to all who donated and did Run, Climb and Ski for Relief.